A link seems to exist between financial strain and suicidality – a link that the economic crisis of the last few years has unequivocally exposed in Britain and Greece alike. I went to a service user and carer forum meeting in Manchester last week where people called attention to the fact that Employment Support Allowance eligibility assessments and appeals in this country are evidently causing huge amounts of distress in mental health service users and carers, and tragically there have already been cases where people have taken their own life following problems with changes to their welfare benefits. As regards the situation in Greece, I recently came across a correspondence paper (presented below) in the Lancet entitled ‘Increased suicidality amid economic crisis in Greece’ ( www.thelancet.com; Vol 378 October 22, 2011 p. 1459). The paper was authored by Marina Economou, Michael Madianos, Christos Theleritis, Lily Peppou, and Costas Stefanis from the University of Athens- University Mental Health Research Institute and Department of Mental Health & Behavioural Sciences, School of Health Sciences. Greece has entered a long period of economic crisis with adverse effects on various aspects of daily life, including the mental health of its citizens. Within this context, the Greek Ministry of Health reported that the annual suicide rate has increased by 40%; nonetheless, a systematic investigation to address the effect of the Greek economic crisis on suicidality is still lacking. In an endeavour to fill this gap, the University Mental Health Research Institute (UMHRI) implemented a nationwide cross-sectional telephone survey, completed on May 1, 2011. A representative sample of 2256 respondents was drawn from the national telephone-number databank, with telephone numbers belonging to businesses or services being excluded. Informed consent was obtained from all participants and the study was approved by the UMHRI Ethics Committee. Recent suicidality was assessed with the Structured Clinical Interview for DSM-IV Axis I Disorders (SCID-I) and financial strain was measured by the Index of Personal Economic Distress (IPED), an eight-item scale with good psychometric properties. Of the study findings, the most alarming one pertained to suicidal attempts. There was a 36% increase in the number who reported having attempted suicide in the month before the survey from 24 (1·1%) in 2009 to 34 (1·5%) in 2011. We also found that a significantly higher proportion of respondents with an IPED score of 15 or more (ie, high economic distress) had attempted suicide in the month before the survey than had respondents with an IPED lower than 15. Similarly, a significantly higher proportion of respondents with a high IPED had shown suicidal ideation in the month before the survey than had respondents with low IPED. These results accord with those of Stuckler and colleagues, who reported a 17% increase in suicides in Greece between 2007 and 2009, and might suggest that the ways in which economic distress is experienced by the population could be discerned in their increased suicidality. Consequently, there is an urgent need for intensive screening, follow-up, and treatment of people with suicidal ideation, especially now that the recession has led to increases in both suicide attempts and suicides. Despite the turmoil, Greece is struggling to maintain a social welfare state; however, gaps in primary health care render the situation hard to address. Telephone helplines might contribute to alleviating the stress germane to financial hardship, prevent the proliferation of suicidal thoughts, and guide people to effective and timely treatment. Stuckler D, Basu S, Suhrcke M, Coutts A, McKee M. Effects of the 2008 recession on health: a first look at European data. Lancet 2011; 378: 124–25. What is most alarming is that in spite of the rapid increase in suicide rates and rates of mental ill health in Greece in the last few years of economic recession, in August 2011 the Greek Finance Ministry announced its decision to slash funding to the 210 state mental healthcare facilities operating in Greece by some 45 %, from 82 million euros to 45 million euros, which experts said would inevitably lead to the closure of most of these units. Numerous protest rallies have been organised since then at the Greek Ministry of Health demonstrating against the drastic cutbacks to mental healthcare, and Greek mental health activist organisations have lodged appeals against the Greek government’s decision with the European Commission, the Greek Ombudsman and mental healthcare foundations around the world, among others. 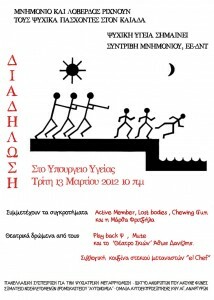 The poster below calls to a protest rally at the Greek Ministry of Health in Athens in March 2012. The main message of the poster, a very powerful message that is also represented visually, is that those who suffer mental ill health in Greece are thrown/done away with into Kaiadas -where ‘Kaiadas’ was a chasm in Ancient Sparta, in the Peloponnese region, in which – according to Greek mythology – Ancient Spartans threw their weak and deformed infants, as well as criminals, traitors and war prisoners.